All Things New presents a study of Schleiermacher's important but sometimes misunderstood Christian Ethics. Brandt places Schleiermacher's ethics in the context of his life, illuminates its main themes, and corrects some common misperceptions about Schleiermacher and his work. He argues that Schleiermacher's ethical concerns helped to make him truly a "Reformed" theologian. 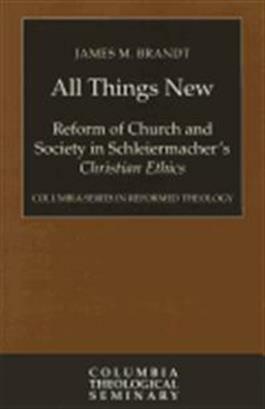 All Things New also shows Schleiermacher to be more than an "academic theologian," but rather one who was a churchman and pastor, and who energetically engaged in both church and political activities. The Columbia Series in Reformed Theology represents a joint commitment by Columbia Theological Seminary and Westminster John Knox Press to provide theological resources from the Reformed tradition for the church today. This series examines theological and ethical issues that confront church and society in our own particular time and place.